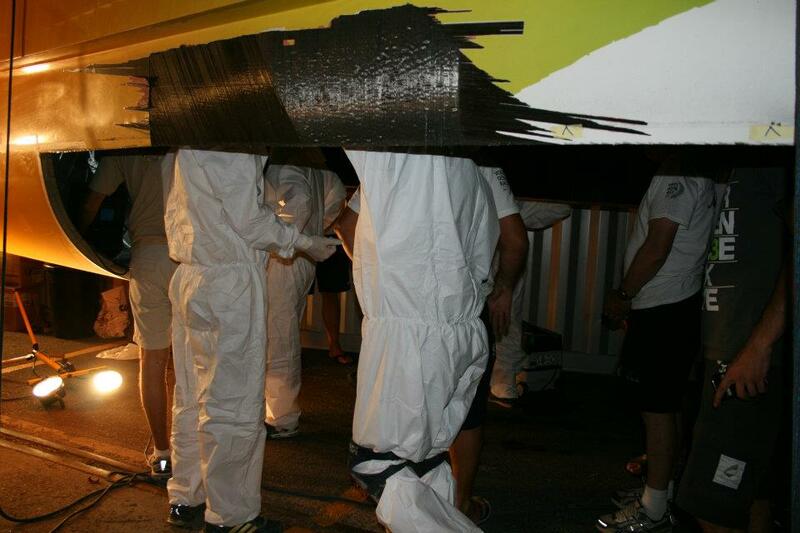 So - heres something to think about - in 7 days, Team Sanya's Volvo70 has gone from having 8 men standing with their heads inside a gaping hole in the hull, to having this complete shiny, glistening new bow section . Well done boys - all of you!!! Greg Salthouse and his team of 5 expert boat builders are a long way from home in New Zealand and a long way from that midnight phone call a month ago that had them packing their bags and flying ½ way round the world to help Team Sanya with a major hull repair of their Volvo70. Team Sanya had damaged their bow section early in leg1 of the Volvo Ocean Race. And while all her crew where unscathed in the incident, the boat certainly was not. Early reports showed a gaping hole in the bow section and after making their way safely to port, the boat was then set on a ship bound for Cape Town for a rendezvous with 'rescue repair team'. For the Salthouse boys the first 2 weeks in Cape Town where spent building a male plug and laying up the laminate to create an oversize bow section that would ultimately replace the damaged portion. 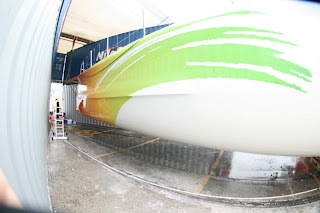 Time was ticking and the pressure was on to have the new bow section completed by the time the boat arrived safely into the hands or her waiting Team Sanya crew. On arrival and within minutes of the boat being settled on the dock at Cape Town, the Salthouse boys where assessing damage and preparing to cut into the hull. Once the damaged portion was removed, the new hull section was then ‘trimmed’ to fit and ‘voila’ – no more holes!! If only it was that easy!! There has been a lot of work done in a very short period of time with some dirty, dusty and very tired boys from Salthouse Boatbuilders.The aim for Team Sanya is to have the boat in the water by December 7th, ready for the in port race before the start of leg2 on December 11th.